There is nothing like a library for making memories. My earliest memory of the neighborhood library was from grade school. Founded in 1875, Bayne Park Library was one of the oldest, scariest buildings in the borough of Belleview, Pennsylvania. Getting a library card was a rite of passage and I was proud to be issued one. I loved reading about ancient Egypt and the discoveries of the tombs of the pharaohs. The library was also a meeting place. In the winter, they would freeze part of the four-acre site into an ice skating rink. In the hot summer evenings we would sit around the park, doing things we didn’t want our parents to know about. As I got older I was able to go to the big library in downtown Pittsburgh, but it was not the same. The Andrew Carnegie Library was huge and rather daunting. There was no time to goof off if I wanted to catch the bus back home. Grand Turk’s Victoria Public Library after the fire in March 2017. Although I visited the Library only a few times in the 20 years I have lived on Grand Turk, I always appreciate what it represented: respect for the ability to read, knowledge, learning and a physical embodiment of an important period in the history of these Islands. At a more visceral level, it was a keystone anchoring and preserving the 19th century character of Front Street, even as so many of our majestic old buildings were being lost. Now it, too, is gone. TCNM staff member Ivy Basden says, “During my Primary and High School days my schoolmates and I used to go to the Library to do our homework. The subjects that we had to find answers for mostly were History, Geography and general knowledge. I also borrowed books from the Library to read on a weekly basis. There was also a showcase there with a glass top that displayed artifacts that were found around Grand Turk and the family Islands. 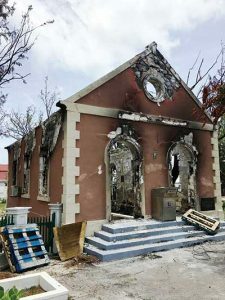 As the most comprehensive repository of the history and culture of the Turks & Caicos Islands, the Museum was bombarded with inquiries regarding the Library after the fire. We immediately looked through our files to see what, if anything, we had pertaining to its founding, purpose, design and construction. That is when I opened an archival envelope marked “Victoria Library—building costs” and found a set of remarkable documents. The originals, all handwritten, of these documents were at the Victoria Public Library in 1976. So many items housed in the Library have disappeared. I was concerned that these documents would disappear also. In those days there were no copy machines on Grand Turk, so I had the original documents transcribed on a typewriter. This 1901 postcard shows a crowd in front of the Victoria Public Library. The first of these 60 pages were the minutes of a meeting held for the Public Library on March 15, 1889. Since the Library had not yet been built, these meetings were held using church premises. Familiar names like Hutchings, Murphy, Bascombe, Durham, Gibbs, Lightbourne and Harriott are prominent throughout the documents. There was also a box of documents in the Donald H. Keith Science Building. I carefully opened it to find an original document from March 2, 1896. It appears to be a peppercorn lease granting the land that the Library sits on to the “Victoria Trustees,” perhaps marking the completion of the project. The ink had bled through both sides of the pages and could be read only with difficulty. Together, the documents revealed the impetus for establishing the Victoria Public Library, its design, and how its exorbitant construction cost of 312£(!) was funded by public subscription. The process started almost ten years earlier, in 1887, the year of Queen Victoria’s Golden Jubilee. On the 8th of July 1887 it was resolved to erect a Free Library and Reading Room in Commemoration of the Queen’s Jubilee and a committee was thereat appointed to raise the necessary funds and carry such resolution into effect . . . . Moved by Hon J.D. Murphy and seconded by Hon A.N. Harriott that a Public meeting be called through the medium of the Royal Standard newspaper with the view of obtaining an expression of opinion for the community at large as to the best mode of celebrating for the Jubilee year of Her Majesty’s accession to the Throne . . . .
On the 8th of July 1887 it was resolved to erect a Free Library and Reading Room in Commemoration of the Queen’s Jubilee and a committee was thereat appointed to raise the necessary funds and carry such resolution into effect. Whereas the said Henry R. Been hath offered to furnish all necessary materials and to build the walls and perform the entire masonry of such Library and Meeting Room for the sum of three hundred and twelve pounds sterling. The said work to be finished and completed within the term of nine months to be computed from the date hereof. The said sum of £312 will be paid at the times and in manner the following that is to say—the first payment of £30 to be made at the execution of these presents. The second payment of £50 to be made on the completion of the foundation (fifth course of masonry). The third payment to be made of £50 on the building being erected to the height of seven feet above foundation. The fourth payment of £50 on the building being erected to the height of the wall plate/15 feet above the surface at the Western elevation. The fifth payment of £60 to be made when the gable ends are erected and the walls plastered on the outside and the last payment of £72 to be made when the inside walls are plastered and the entire work contracted for is completed. The work at each of the before mentioned stages to be approved by the said Building Committee before the respective payments are made. Provided nevertheless and these presents are upon this condition that if the said Building Committee shall thereafter determine to dispense with the Clock Turret shown in the plan and specification there shall be an abatement of £6 in the said sum of £312 paid such abatement to be deducted from the last payment of £72 hereinbefore stipulated on the competition of the contract. It seems everyone was in favor of a Library, and folks donated what they could. Some donated money, some donated salt, and some donated bananas, eggs and bacon. 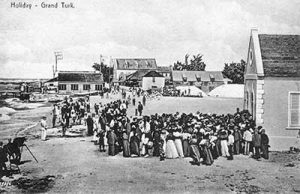 It came from all of the islands, not just Grand Turk. Originally, the building was supposed to be 50 x 30 x 15 ft but the Committee came to the unanimous conclusion that the amount the subscribers could contribute would not cover the cost of such a building, consequently a plan of 40 x 25 x 15 ft was agreed upon and the “Clock Turret” was deleted from the design. The specifications of work required were also found in these important documents. All of the documents in the Museum’s archives were copied and given to architect Ron Shaw who will be doing the drawings to reconstruct the Library. We also gave copies to Mr. Cecile Graham, Chief Librarian, and Ms. Janet Williams, Grand Turk Librarian. While accompanying Mr. Shaw during his inspection of the Library’s ruins, Museum Chairman Seamus Day was able to retrieve original iron fasteners and hardware such as window sash weights, ornate hinges, shutter brackets, tie rods and some very large nails and spikes—“architectural DNA” which could be incorporated into the Library’s reconstruction. These small details will also be helpful in piecing together a plan to rebuild the Library, since we did not find any original architectural drawings or photographs of its interior. Buildings are just masonry and mortar and can be replaced—but at what cost? The collective memories preserved at the Library were priceless. The Museum staff was extremely pleased that Founder Grethe Seim had the foresight to copy these documents and leave them in our archives. If not for her, the history of how and why the Victoria Library was conceived, designed and built would have been lost forever. The destruction of the Library once again brings into question the security of other important documents held in the Turks & Caicos Government Office—and the need for a National Archive. At the Turks & Caicos National Museum Foundation we take our job of being custodians of TCI history very seriously. We hope that the TCI Government will also see the importance of securing the history of these wonderful Islands and partner with the Museum to build and staff a National Archive.